The range of fresh Chinese vegetables available in London is growing all the time, and the best news is that some of them are grown locally. 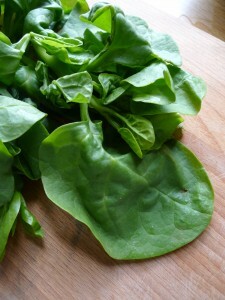 Among the home grown greens I’ve found recently is this Malabar spinach. 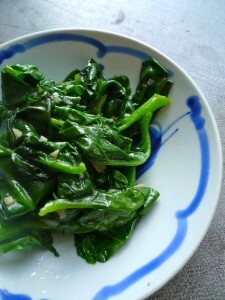 It’s a favourite vegetable in Sichuan, where it is often served in clear soups or stir-fried with garlic. Its plump, rounded leaves have a delightfully slippery texture after cooking, which is why it is known as ‘cloud ear mushroom vegetable’ (mu’er cai 木耳菜) or ‘tofu vegetable’ (dou fu cai 豆腐菜 ）The flavour of the leaves is reminiscent of spinach. Oooh. Where did yo find it? Little place opposite the entrance to the Chinatown printers, in an alley just off Macclesfield Street. I’m trying to make La Mian noodles. I understand the Chinese use something called Peng Hui to make the dough more stretchy. I don’t think it’s available in the UK. Would you know of a substitute for Peng Hui? Thanks and sorry for positing on another topic here. Fucshia, have you considered pulling a Julia Child and “defecting” to a non-Chinese cuisine? This might sound a bit iffy, but some noodle-pullers add borax to their dough. I would put a question mark next to that, however. Have you tried using an alkaline solution of some sort? I haven’t as yet. I have just bought some Lye Water so I’ll give that a go.